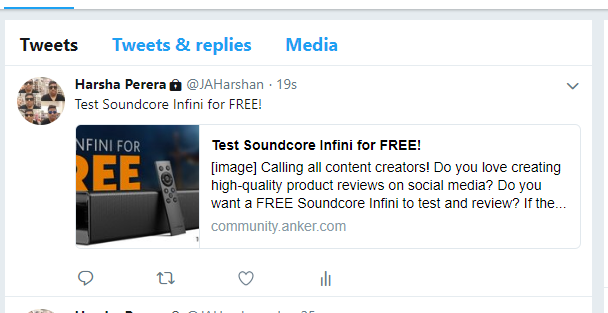 Will be great if selected for testing this product. Here is my test plan. 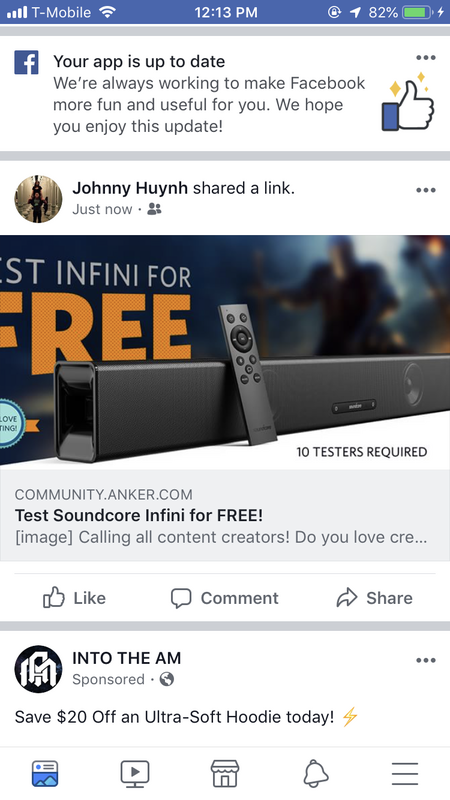 - Connect it with my UHD TV to test the sound performance. 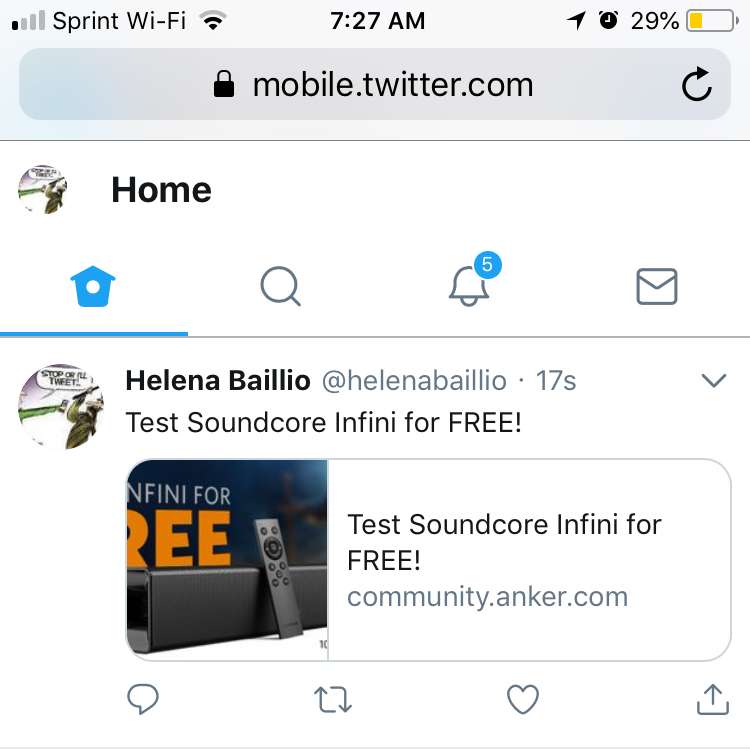 - Connect with my phone and Echo Dot for bluetooth performance. 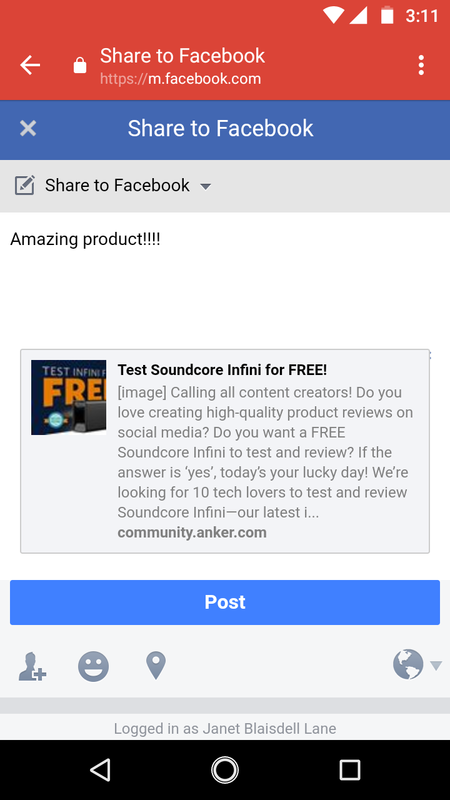 - Share the review on social media and also tell my friends and colleagues about this speaker. I would video the unboxing and setup process. Then proceed to have a movie marathon, most likely Lord of the Rings, to test its quality and longevity. 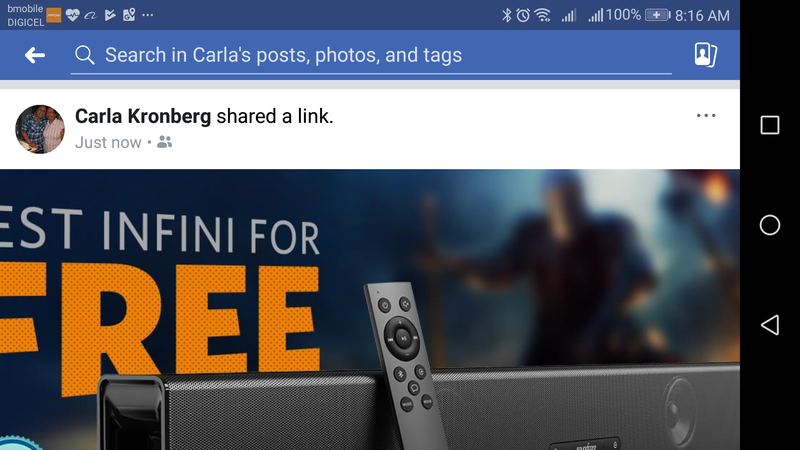 I would begin by videotaping and sharing a live video on Facebook me opening, and setting up Infiniti. I want my viewers to see an unplanned opening, for them to know that banker makes great products. My plan is to review and as I review show how this works with the other anker products I have bought, e.g. nebula, as well as other products. 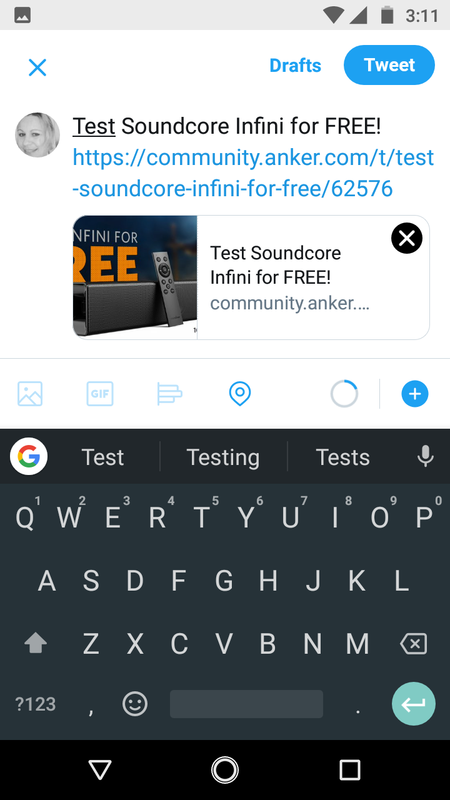 To show the product, it's connection to other products esp anker products. Show how well it works with other products. I will share on other social media, utube, instagram. I would love to test this!. 4. Showing viewers how terrible the sound from my tv is...almost makes me not even want to watch anything! 5. The simple quick couple of steps to install/set it up. 6. The different sound modes and how easy it is to modify to your entertainment needs. 7. And then sit back try a few different types of movies and some music so I can let all the other moms know how nice it is to have good quality sound for music while we are cleaning the house or even having a small get together...whatever the occasion may be. 8. Then for the last part I think it would be epic for "the man of the house" to come in surprised that the tv didnt sound as crappy as normal then notices the new sound bar that sounds amazing but also happy he didn't have to help set it up after a hard day at work. 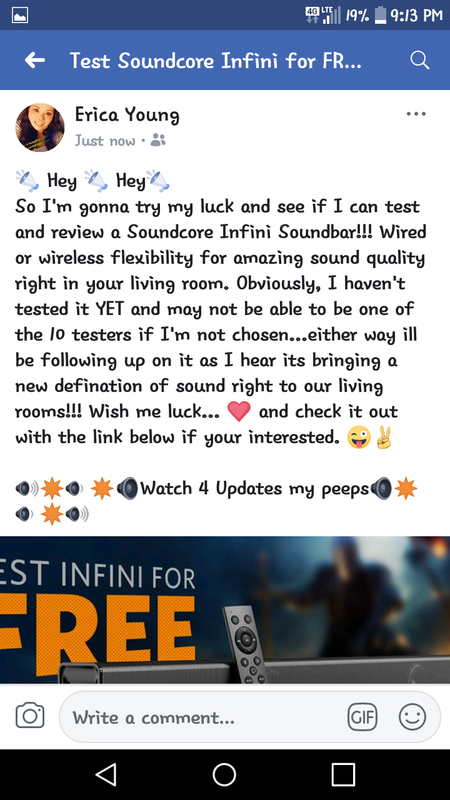 Basically have fun make a few stay at home mom jokes about things that have been difficult to set up by myself (of course non offensive jokes abput myself) show how easy it is to set up the SoundCore Infini sound bar and be able to continue on with the day being able to listen to whatever it is that's needed at the time. First video would be unboxing (read spec), basic installation, and ease of use. I’ve got some brains that need stirring. I’ll be back!!! - Test product in both AUX port and Bluetooth connection. - Recording video each of steps. - Check the quality of product with variable distance. I would love to review this amazing sound bar. I would review on all of my social media sites. I have 3 kids that love to mess with my new electronics. My 7yr old has an affinity for audio equipment. So, I plan on testing this device myself, as my current soundbar is inadequate. My son will help me with the set up and testing. I plan on filming all apspects of the open to install to use. I also think it’s important for my son to be able to know how to use this. My son will be included in all aspects of testing, along with his review. I watch a lot of movies/shows on Netflix and videos on YouTube in my room. 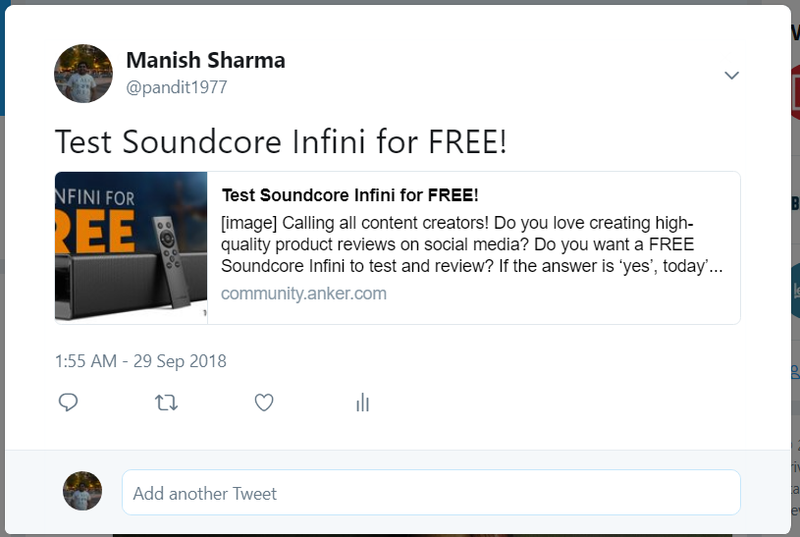 I plan on reviewing this product by watching different types of movies that the Soundcore Infini would work great with such as action movies, horror movies, comedy movies, etc. 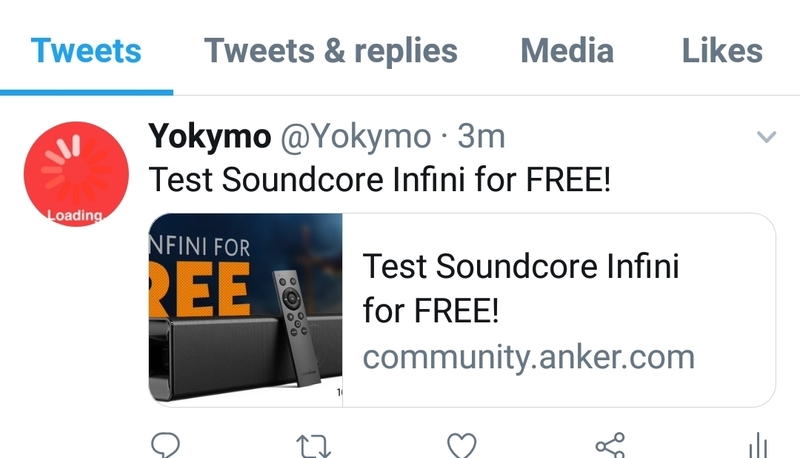 Although I do not use my PS4 often, I would also test the Soundcore Infini with the games I have and see how that sounds. 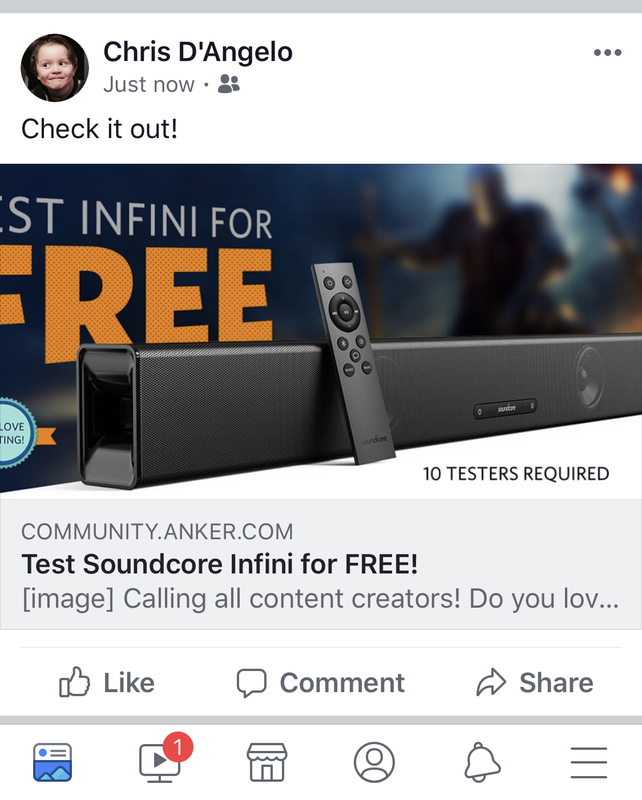 My sister has a sound bar by Vizio in her room (which is the same size as mine) so I would be able to make a great comparison between her sound bar and the Soundcore Infini. 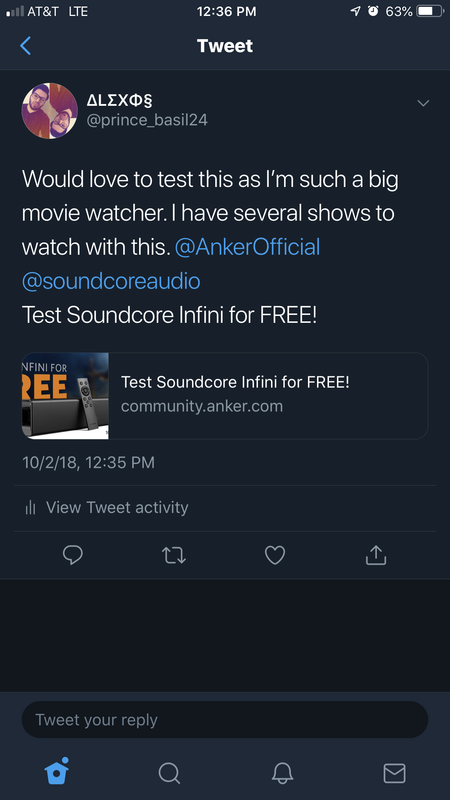 I believe that I would be able to test the Soundcore Infini fairly well because I watch a lot of movies, shows, and videos in my room. I believe that I would be able to review this product very well. Would love to test this out as I am a audio junkie and would the opportunity to try out the latest in audio tech. I LOVE doing reviews, just as much as I love getting them. I am a Scentsy Independent Consultants, as well as working with an HVAC/Plumbing company (5 STARS on our reviews! ), so I know just how important reviews are. My husband and I love hosting football parties, (among others) so, I will gather feed back not only from us, but our friends as well. 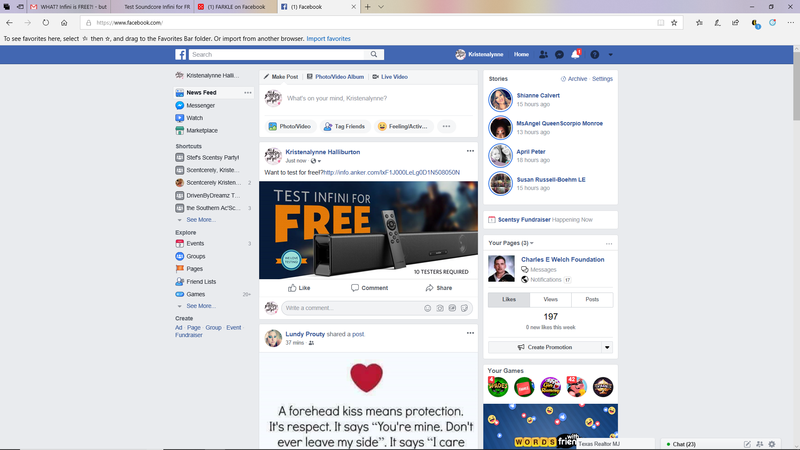 I will go live multiple times on Facebook, on both my personal page, and my Scentsy page. And not to mention the photos that will be taken! On LIVE, I will do the unavailing of the soundcore, and the set up (heck if I can do, anyone can! RIGHT!?). Now, lets be real. Most people just don't listen to just sports on their sound bars(sound systems in general). So, I will not only display (LIVE) of a football game, or a baseball game, but movies, from all genres. And, lets not forget kid & adult cartoons, regular TV shows, or the music channel on the satellite. From ALL that, I will ask what everyone thinks about this particular soundcore. Do like it less or more than the current on they have. If they don't have one, would they go and get THIS one? What is the good and the bad about this particular soundcore? So, overall, it will be real reviews from not only myself, but friends and family as well. All ages will be included, why put an age limit on someone if they like/dislike something? Hope I get picked. We stay watching new shows and movies and I’ve always wanted to have bigger audio. My husband and I both are movie buffs so this will get put through the ringer. I also love play music while I cook so I can’t wait to try that out as well. Thank you for this opportunity.